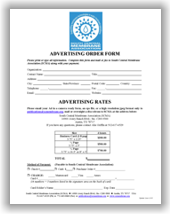 We are pleased to offer members the opportunity to promote your business or highlight a new product via banner advertisements. Banners are placed under the “SCMA Supporters” section of our home page and are subject to a random rotation, allowing web visitors to see a variety of ads at any given time. Logos or artwork can be submitted in .jpg, .gif, or .png format at 290 pixels wide x 74 pixels tall. Please complete the online form below. If you prefer to mail or email your order form, click the PDF icon at right to download the hardcopy order form, complete and return it with your banner image to the attention of Alie Griffin via e-mail at publications@amtaorg.com or to our mailing address. Please note that SCMA has the right to refuse acceptance of the banner ad order requested. Size shown in pixels. GIF, JPG or PNG file formats allowed. 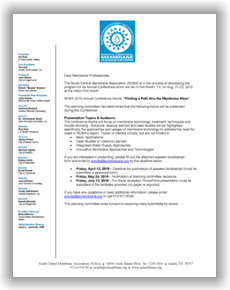 You may also submit artwork via email to publications@scmembrane.org. Please submit the URL that you would like the image link to. Make check payable to the South Central Membrane Association and mail it to 14900 Avery Ranch Blvd. ; Ste. C200 #300, Austin, TX 78717.